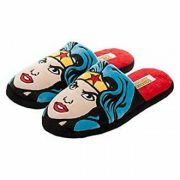 If you love funny clothes and accessories, there is no way you won’t appreciate a pair of silly goofy slippers for wearing at home. Silly funny slippers make hilarious gifts for Christmas, birthday, anniversary, Halloween and any other special occasion as well. So, why not make your home life a bit more interesting and fun? Here are 22 silly funny slippers for adults and kids that can surely make your day! 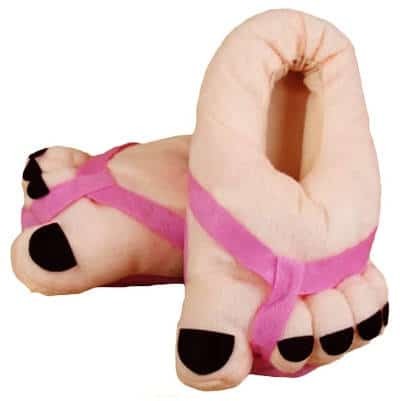 If you like hairy feet but you are not bold enough to grow your own, this Hairy Feet Slipper will not only give you a hairy look but a hairy foot wearing a sandal look, so you get two in one, both hair and a sandal. 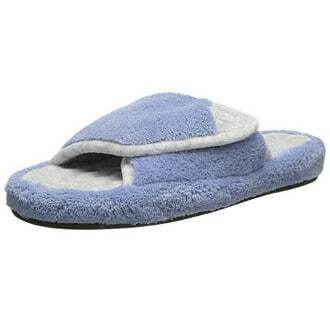 According to users´ reviews, this hairy slipper is hilarious as well as quality, well made and comfy. It comes in various sizes for adults and kids, and features a 1 inch memory foam rubber and a non-skid bottom that is suitable for indoor use only. These big hairy feet slippers are fun to wear and make a great gift for Lord of the Ring lovers or Hobbit lovers. 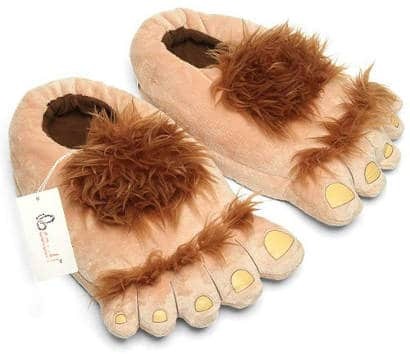 These humorous slippers are also ideal for Hobbit costumes and come in larger sizes that are good for extra wide feet. In addition, they are warm and plush filled with foam and have a padded sole. The bottom has black anti-slip rubber dots. 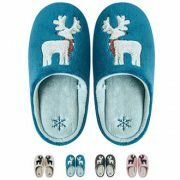 Users love the funny design of this silly hobbit slipper and say that it really makes people laugh and is a great gift for Christmas as well as birthdays. They also review it is comfy, soft, well made and warm. 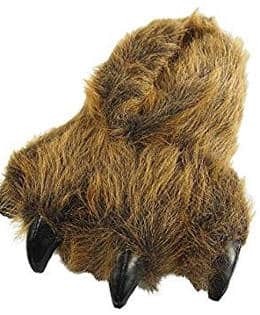 If you like furry animal slippers, this grizzly bear paw slipper looks very realistic, making it a big hit. It comes in sizes both for adults and kids, and features a thick foam cushioned footbed and a textured outsole. Users find them really comical and fun as well as very comfy, warm and really soft. They fit great and hold up very well, too. 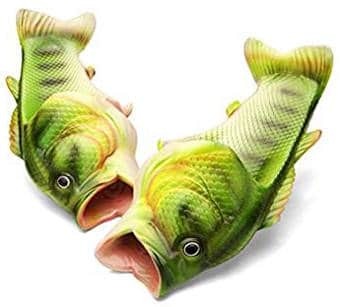 These hilarious fish sea animal slippers make a great gift for fishing lovers, fishermen, bass fishers or anyone who loves fish. 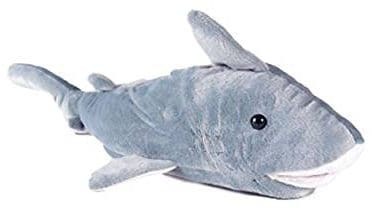 They are fun fishing slippers and you can wear them on the beach or when you have a fun time at home doing some barbecue in the backyard or any other fun summer activity. Users review that these fish slippers are made of good material and they are sturdy and fun. While some users find them comfy, few others have mentioned that the soles are hard, which makes them uncomfortable. 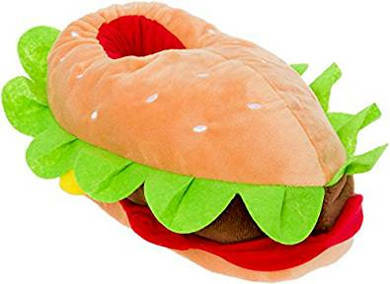 If you are a hamburger lover, there is probably no sillier slipper to buy than this cheeseburger slipper. It does not only look super funny but delicious as well with an ultra cushioned sesame seed bun filled with yummy ketchup, cheese and yummy toppings. These silly burger slippers are cute, soft, comfy and colourful. In addition, they have traction dots on the bottom. 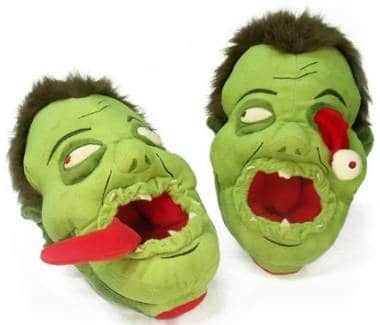 These zombie slippers are fun gifts for Zombie lovers or fanatics, and are great slippers for Halloween or any other time you want to add a bit of fun to your home life. 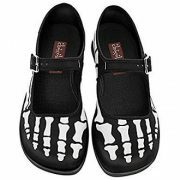 Users love the excellent details of this silly zombie shoe and find it warm and comfy with a thick padded bottom. It is also roomy, sturdy, well made and good quality. One fun detail? You can keep the eye of the zombie in or make it pop out. 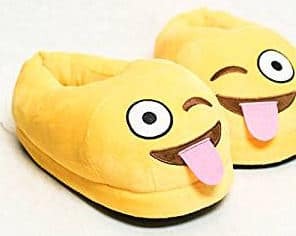 These Emoji slippers make a cute and fun gift for Emoji fans. 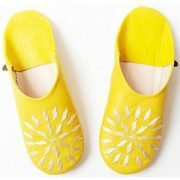 They are available in one size and feature a cushioned bottom with tiny rubber dots. Users find them comfy, warm and cozy. 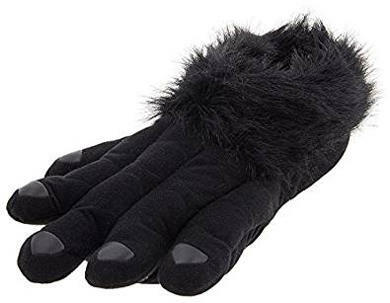 If you want to buy a goofy pair of slippers to offer as a gag gift for Christmas or any other occasion, these humorous gorilla paw slippers can do the job. They are made of polyester with a faux fur upper and dots on the bottom. 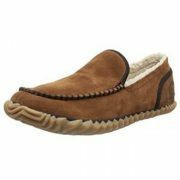 Users like the padded top and bottom, and say that this fun gorilla footwear is well made, comfy and warm. 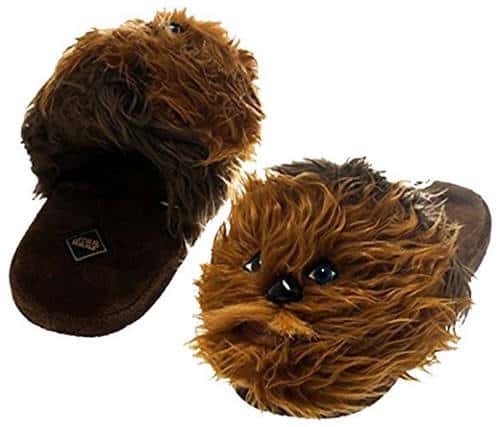 These officially licensed Chewbacca Slippers are a great gift for Star Wars fans who enjoy wearing fun Star Wars slippers. They are made of polyester and come in sizes for men as well as women. 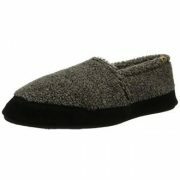 Users love the looks of this shoe and find it well made, warm, soft and plush. Few people, though, mentioned that the slippers slip off their feet a bit. 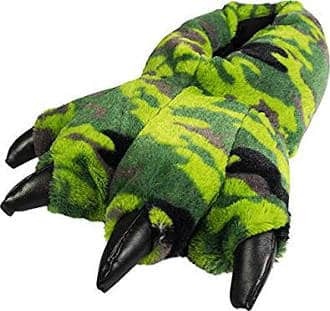 If you are a fan of paw slippers, these Norty stuffer animal slippers come in various paws designs such as black bear, brown Bengal tiger, green Dino camo, leopard, white polar bear and more. 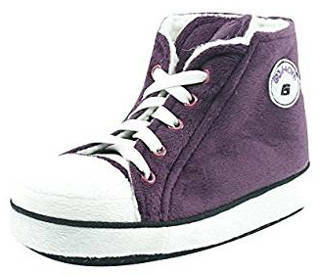 They come in sizes for men, women and kids, and they are synthetic with a padded sole and rubberized dots on the bottom. 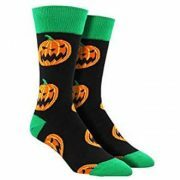 Overall, they are fun to wear at home and can also be worn as a finishing touch to your Halloween costume. If you like silly slippers, buying a fun animal slipper such as a turtle slipper is a perfect idea especially if you are buying for someone who is a turtle lover. These Happy Feet turtle slippers come in sizes for adults as well as kids. They feature a dense foam sole and a non-skid bottom that is suitable for indoor wear only. 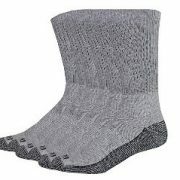 Users review that they are very soft, well made, good quality, comfy and warm. The turtles look super fun as well. If you have always dreamed of travelling to space or you wanted to become an astronaut when you were a kid, this Silver Lilly spaceship slipper is for you as well as for anybody who is a space lover or an astronaut fan. 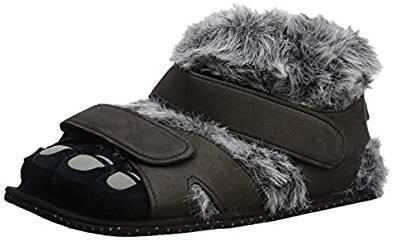 This fun space shuttle shoe features a super plush cushioned upper, soft lining on the inside that offers warmth and comfort, an ultra-cushioned footbed and traction dots on the bottom. 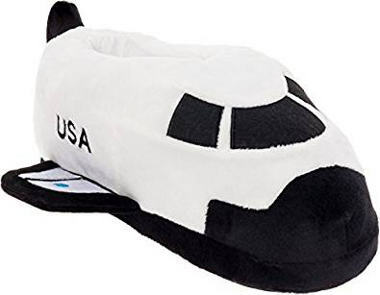 Users like the fact that these astronaut slippers are a great fit as well as comfy, cozy and soft with a thick padded sole. 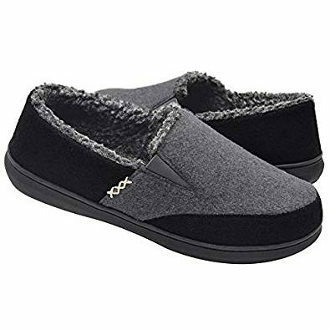 These sneaker style bootie slippers for women are lots of fun. They have elastic shoelaces, plush fleece lining and an outsole with rubber beads on. They also protect your ankles from cold and come in various colour options. Users are very pleased with the looks and functionality of this humorous bootie. They say that it is good quality, durable, warm, very comfortable and nicely cushioned. It also fits great and is easy to put on and take off. For the shark lover in your life, these shark slippers will make a great gift for Christmas, birthdays and other occasions. 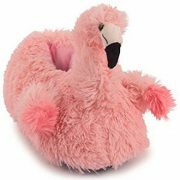 This stuffed animal footwear is well made and, as with the other Happy Feet slippers we have included in this review, it has some good quality features and of course funny looks. 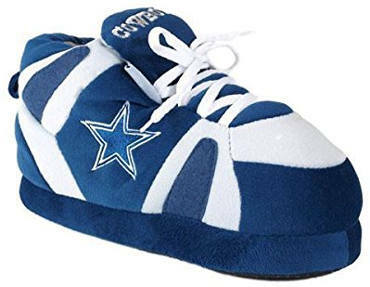 These fun NFL football slippers make great gifts for football lovers. They come in sizes for both adults and kids, and of course you can choose your favourite soccer team slipper to wear. 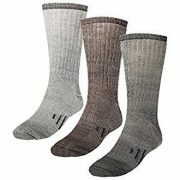 Users review that they are very comfy with lots of padding in the bottom as well as cuddly and warm. They also fit great and they are quality, well made and good looking with great attention to detail. 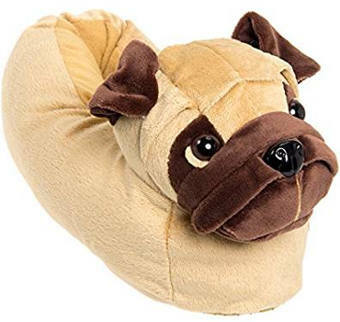 For pug dog lovers or fanatics, these cute fun dog pug slippers come in sizes for adults and kids. 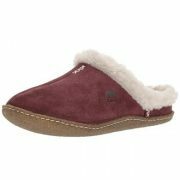 They feature very cute pug details as well as a padded footbed, a cushioned upper and a gripped bottom. Users love the looks of this pug shoe and find that it fits perfectly and feels warm, soft and cuddly. 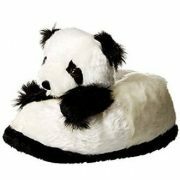 These big feet slippers work great as fun stocking stuffers or gag gifts. Users find them hilarious and mention that although their quality is not great, it is fair for the price. There is also some grip on the bottom and some users find them comfy and warm. Nevertheless, a lot of reviewers say that this shoe runs small. 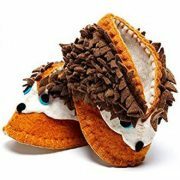 These cute stuffed animal slippers for adults and kids are a great gift for animal lovers. 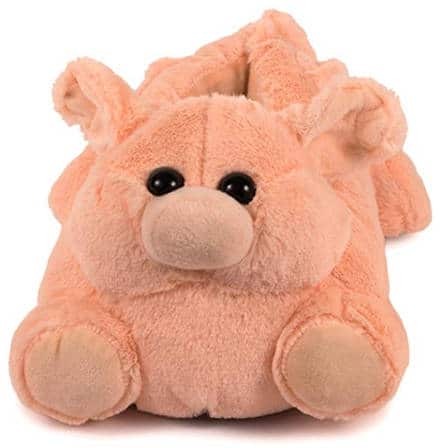 In the picture above we have selected to show the pig version but all the other options such as the penguin, frog, bunny, moose, flamingo and the others are also very funny looking. 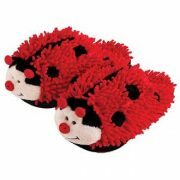 This fuzzy animal lover slipper features a padded footbed which is shock absorbing, soft lining and rubber dots on the bottom. 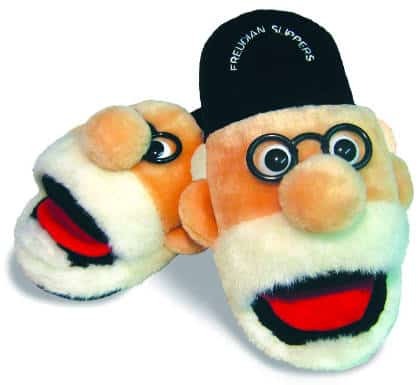 These Freudian slippers surely make silly funny gifts for psychotherapists, psychologists, psychoanalysts, Psychology teachers or anyone working in the mental health field as well as psychology college students. Apart from the whole fun looks of this shoe, another funny element is the wagging of Freud’s tongue when you wiggle the toes. This psychology lover gift is available in sizes for men and women and comes in a nice looking gift box. Users find it hilarious and comfy. 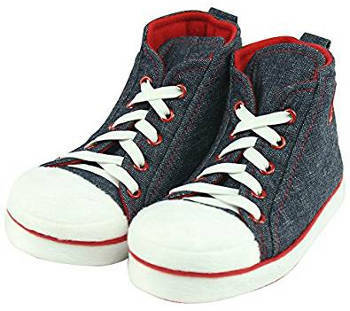 These fun sneaker style slippers for men are soft with a high top that keeps your feet warm, a cushioned foot bed and a lace up design that makes the shoe easy to put on and take off. The bottom is soft, anti-slip, quiet and does not leave any scuff on floor surfaces. 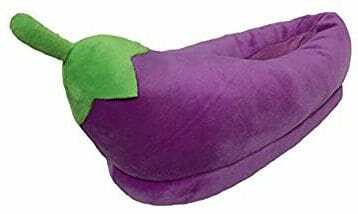 Eggplant slippers make funny gifts for vegetarians or anyone who is a veggie lover or eggplant lover. This eggplant shoe is soft and warm. It fits men’s sizes 8-11.5 and women’s 5.5-8. There are also traction dots on the bottom and it comes with a satisfaction guarantee. 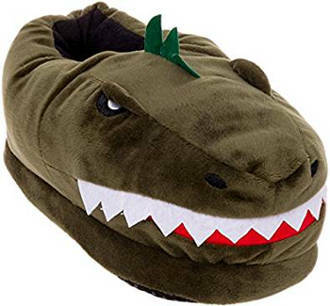 For men and women who are dinosaur lovers and specifically T-Rex lovers, this Dinosaur T-Rex slipper makes a great fun gift. There are some nice details on this shoe such as the fierce eyes of T-Rex and the sharp teeth. 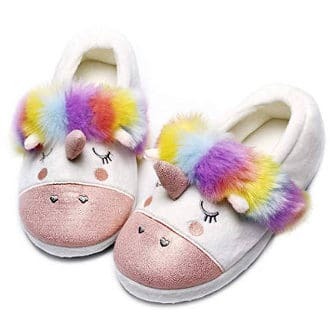 All in all, the above silly funny slippers for adults and kids make great fun gifts for anyone in your shopping list such as family members, friends or working colleagues for Christmas, birthday, anniversary and other special occasions.